IT Unit, FRIM supported the website hosting services till 2015. Not a member of APAFRI yet? 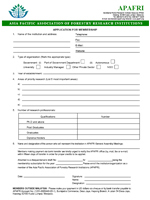 APAFRI membership is open to all institutions in the Asia-Pacific Region actively engaged in forestry or forest-related research. Member institution shall nominate official representative to be the contact person to facilitate communication from the Secretariat, and also as the delegate to the once-in-three-year General Assembly. 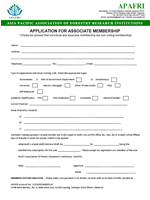 APAFRI also welcome individuals to join as non-voting individual members. The fee for non-voting individual member is only 10% of that for the individual’s country of residence. For example, the fee for a staff member of an institution in a developing country (Category II) is only US$25 per year! The Constitution states that members whose dues are not paid for more than 12 months are deemed to be in default and shall not enjoy the membership benefit until the subscription is fully paid. However, the Secretariat has been very lenient in applying this rule. For example, we continue to send out free copies of our publications to institutions which had not paid subscriptions for many years. Likewise staff members of these defaulted members have never been denied travel support unless budgetary constraint dictated otherwise.